From the wedding portfolio of Kurt Vinion based in Prague. Miranda & Sean romantic wedding portrait captured at the Charles Bridge before sunrise. They traveled over from China to marry at the Clementinum, but before they had their dream wedding they had a pre sunrise portrait at the Charles Bridge. Many couples are foregoing having big weddings and instead having artistically created portrait sessions on the day of their elopement wedding. As the focus is on capturing and creating a stunning set of artistic images that can be presented at home via a large print, a coffee table book as well as a slide shows - these sessions are becoming very popular with couples from China such as Miranda & Sean. Prague wedding & portraits by Kurt Vinion - chosen by 7 wedding photographers to capture their wedding days. 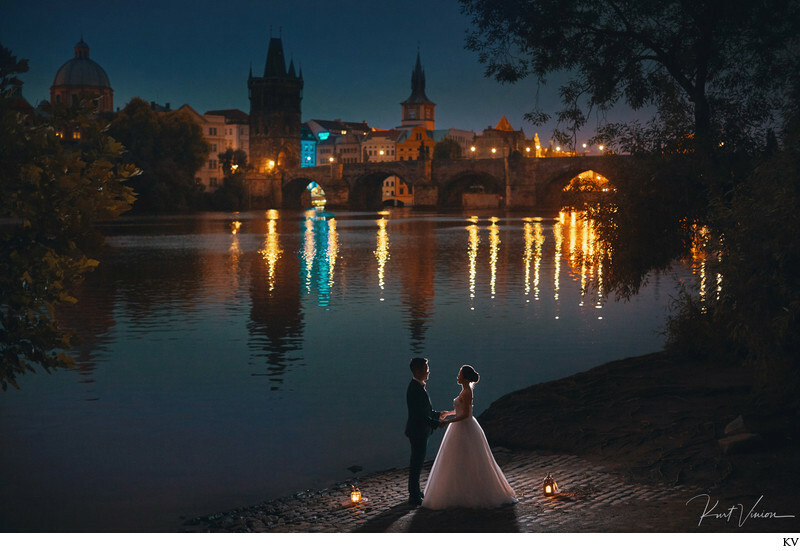 Keywords: artistic wedding portraits (3), Charles Bridge (267), fine art wedding photos (6), wedding photographers Prague (12), Wedding portraits (3), WPJA (9).